The Fusion drive houses a Gen 3 M.2 PCIe solid state module, considered the fastest commercially-available flash storage, combined with a PCIe Gen 3 flash controller. Sonnet claims this and the Thunderbolt 3 connectivity helps the drive outperform USB 3.0-equivalent drives by more than 500 percent, and is capable of transferring rates of up to 2,600 megabytes per second. In this version, Sonnet has increased the storage capacity to 1 terabyte, up from the previous 512 gigabyte option. Sonnet believes the Fusion to be highly useful for video editors with a 4K workflow, as a portable scratch drive for editing the high-resolution video at higher frame rates. The high transfer speeds are also claimed to be a great alternative to a RAID 0 setup, which uses multiple drives for maximum transfer speeds, as this only uses one solid state module to do the job instead of two or more slower drives. 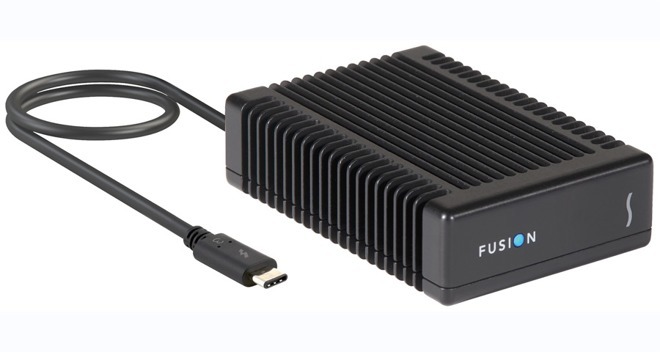 The Fusion is bus-powered, which means it can draw power from the host computer via the Thunderbolt 3 connection instead of using its own power source, making it more suitable for users who are on the move. It can also be connected as part of a Thunderbolt 3 device daisy chain, though its single Thunderbolt 3 connection means it needs to be located at the end of the chain. Measuring 2.8 inches wide by 4.1 inches deep and 1.25 inches tall, the Fusion is enclosed in a rugged case produced from aluminum. As well as providing protection, the aluminum case is also used to cool the drive down, allowing it to run silently without an additional fan. The 1.5-foot Thunderbolt 3 cable attached to the drive is also notably replaceable, with Sonnet assuring that the captive cable can be replaced by the manufacturer or an authorized service center if the cord is damaged, allowing it to be replaced without affecting any onboard data. The Sonnet Fusion Thunderbolt 3 PCIe 1TB Flash Drive is available now from Sonnet's online store for $999, as well as through Amazon for the same price.